Congratulations, 2019 Spelling Bee winners! The traditional Spelling Bee provides elementary and middle school students with an opportunity to learn new words, sharpen their spelling and vocabulary skills, and vie for the title of the school district’s top speller. The top winners of the district's 2019 Spelling Bee competition are pictured alongside SBCISD Superintendent of Schools Dr. Nate Carman. Honorees are, from left, champion – Eduardo Delgado, Dr. C.M. 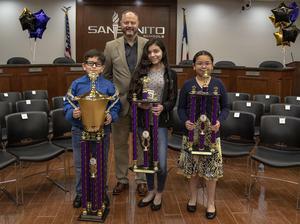 Cash Elementary; second place winner – Lindsey Montemayor, Berta Cabaza Middle School; and, third place winner – Kaitlynn McNutt, Dr. C.M. Cash Elementary.